As they turned onto Harding Street, heading for their neighborhood, Henry thought for sure that Freddie was trying to force them into a race again. Freddie had started to speed up, so Henry and Bonnie leaned into their handlebars and pumped even harder to catch up. As Henry closed in, trailing only inches away from Freddie's rear tire, something suddenly and unexpected happened. Freddie braked his bike so hard that he nearly lost control, skidding to an abrupt stop and barely holding himself upright as his bike careened to the side. Bonnie swerved to the right, trying to avoid a collision with Henry, and ran her bike up on Mrs. Perkins’ front lawn nearly demolishing a freshly planted bed of flowers. Henry, who was tailgating Freddie, was able to stop just before crashing into the back of Freddie's bike, avoiding a bad spill. "What are you doing Freddie! Are you trying to get us all killed or something!" yelled Henry, thinking Freddie was just pulling off one of his stupid stunts. Bonnie took a deep breath and exhaled, relieved that no one was coming out of the house to chew her out. So she dismounted her bike and wheeled it off the lawn and back on the street, feeling a little embarrassed and somewhat guilty, even though she knew it wasn’t her fault. That is until she got to Freddie, and then she exploded. "Are you crazy Fredrick! I almost ran over Mrs. Perkins’ flowers back there," she barked, her face turning red as she pointed toward the flower bed. "I’m just lucky there wasn’t anyone home." Freddie looked at Henry, without saying a word. He just stood there, his face pale and his eyes glazed. He seemed to be in a stupor, unable to speak. "What’s wrong with you, snap out of it! You act like you’ve seen a ghost or something?" Henry said, now realizing that something else was going on with Freddie? "Are you okay, you don’t look right?" Bonnie asked, pulling her bike up close to Freddie. Freddie shook his head looking at Bonnie and then over to Henry and then back to Bonnie again. "What…you guys didn’t see that?" He looked at Bonnie as if she were blind or something. "See what?" They said in unison. "ME!" exclaimed Freddie, almost shouting, holding his hands up, and hunching his shoulders in total bewilderment. "I was standing right there on the side of the road holding up something with words written on it. I almost ran over myself for cripes’ sake!" He looked back at Henry, confused. "You didn’t see it either?" "What are you talking about, I didn’t see anything." Henry wasn’t sure if Freddie was joking or not. "I’m telling you that I saw myself standing right there on the side of the street. I was just standing there waving a sign, but the whole thing was sort of blurry, like fading in and out." Freddie paused for a moment to catch his breath. "And then, when I was about to run over myself, it disappeared. It was like a hologram or something. I don’t know any other way to explain it." He stared at Henry and Bonnie, looking as though he expected some kind of explanation. "You’re not taking any kind of drugs, or medication are you?" Bonnie glared into Freddie’s eyes with uncertainty. "Of course not, don't be stupid!" Freddie was losing patience. "Then what the heck are you talking about. It sounds to me like you saw something that wasn't there," Henry said, not sure of what to make of the situation. "Maybe it was a mirage or something,” Bonnie added. “You know, like when the road looks watery on the horizon? 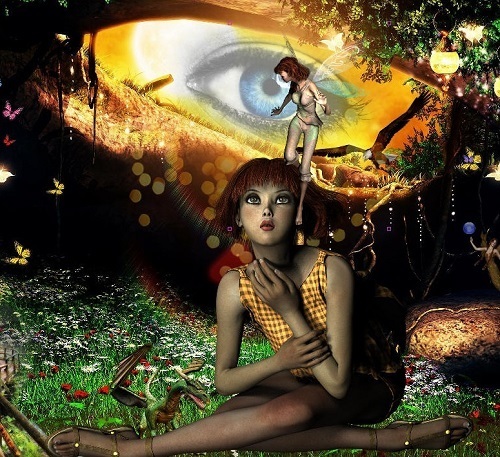 You don’t see anything now do you?" "Okay then, it was probably just your imagination playing tricks on you, don’t you think?" "I don’t know about that." Freddie bowed his head and rubbed his forehead, wondering if he was going nuts or what. "I don’t know, maybe? But it was still scary." Freddie was beginning to feel alienated from the others, realizing how weird he must sound, but he didn't know what else to say. "You’ll feel better when we get to my place, and we get some food and something to drink." "Yeah sure, okay, but let’s get out of here before I’m totally freaked out." Freddie knew what he saw, but he also knew how crazy it sounded and decided not to talk about it for the time being. He just wanted to get to Henry’s house where he could unwind and think. Henry and Bonnie may have found the whole incident somewhat peculiar, but had they remained at the scene a few moments longer, they would have all flipped out. Within seconds after getting back on their bikes and heading down the road, another occurrence took place. It happened in the very same spot as before, but no one saw it as they peddled down the street heading for Henry’s house. At first, it was only a flash, and then it fluttered in and out, just as Freddie had described…Like a hologram. It was an image of Henry holding the same sign. On it were the words, BRIN THE EY. The image didn't last long; only a couple of second or so, and then it was gone. But within a minute, another image flickered in and out. This time it was Bonnie, and she too was holding a sign. The image held for just a moment longer and the words were clearly visible on the sign, BRING THE KEY, and then her image disappeared as well. How can that be, Bonnie wondered? She sat up and looked around her room; it was just as messy now as when she had left it last Saturday morning, and yet today was Tuesday…so she thought. But it wasn’t Tuesday, it was still Saturday, June 24, the same date of her disappearance? That was nearly four days ago? Her mind was ready to explode. Bonnie needed answers, or she was going to go crazy. She thought about calling Henry but wasn’t sure of what to say and yet she was brimming over with questions. Was he okay? Did his parents know he was gone for four days? What did his mother say when he got home? Does he feel the same way she does? Bonnie’s addled brain was unable to make sense of any of it, her parents, the three days, and most of all, the Island? The only thing she felt sure of was that she already missed Jack and Bot. In the past three days, she had grown close to them, and now she would never see them again. She picked up her cell phone and tapped Henry's number, thinking back to Friday, two weeks earlier when Freddie had seen an omen but didn't understand what it was. It all happened rather quickly while on their way home from school. They were the three musketeers, at least that's what Freddie like to call them, "All for one and one for all." It was a quote he picked up from a book report last year, about the Three Musketeers by Alexandre Dumas. Freddie liked to be noticed, but that's just Freddie. Bonnie has been a best friend with both him and Henry since the third grade. They all lived close to each other and were always hanging out together. Henry and Freddie were like big brothers, filling the shoes of the siblings Bonnie never had. Today was Friday and students were anxious for the final bell, which rang precisely at 1:55 p.m. ending the school day. Bonnie met up with Henry and Freddie in the hallway, and after visiting their lockers, the three Musketeers followed the other eighth-graders out through the main doors of Prodell Middle School and into the scented bloom of spring air and the warm Long Island sun. It was a glorious day...and tomorrow was Saturday. On their way to the bicycle racks, Bonnie began to tease Freddie about racing their bikes. "Let's not race to Henry's house today, I don’t wanna beat you again, it's too embarrassing," she joked, showing off her dimples with an impish smile. "I don’t think you could handle another beating," she giggled. "The only reason you beat me was because you had a head start on me." Freddie sneered, shaking his head. "And that's only because I let you," he added. After exiting the school grounds, they headed straight to Henry's house where they held their weekly study group, which, to be honest, was nothing more than a gabfest about social media and schoolyard gossip. As always, Freddie made a point by staying up front as they rode their bikes along the side of the road, pointing his index finger toward the sky as if to say, I’m number one. The Valley of Orbs by Ted Lampron is an engrossing visit to a magical world. This novel is perfect for the young fantasy lover with a host of fantastical creatures, lands, and three adventurous youngsters who discover a secret that leads them on an unforgettable voyage into a dimension or realm ruled by magic. The story begins with the end of a school year and three best friends: Henry, Freddie, and Bonnie. When helping to clean up the Wardenclyffe estate, they discover a tunnel leading to Tesla’s secret lab filled with oddities, complex machinery, and a journal. When they decide to explore, their lives (and reality) change in the blink of an eye. After finding themselves no longer in “Kansas,” they are forced to explore their new surroundings in an effort to return home. While traversing this strange new land, they encounter a plethora of intriguing characters, one of which is the Spirit of the Forest—Enchantress Lila. She sends them to seek the help they need and while doing so they meet an undead, an ice queen, fairies, Strigoi, zombies, a robot named Dominus Rabota, wolventrees, dragons, werecats, and more. Like Dorothy in Oz, they are warned to follow the road and not to stray from their path. Even so, numerous occurrences force them from their destination and add to the drama, suspense, and danger. 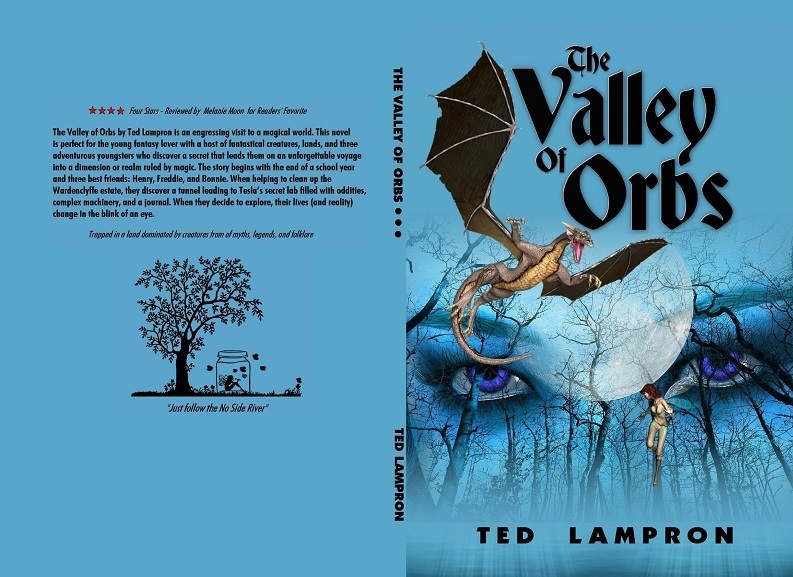 The Valley of Orbs by Ted Lampron was an entertaining escape to a magical realm. Can the three find the “key” and Master Armac in time? You will have to read and find out. Looking forward to book two.